The Zags earned another West Coast Conference tournament title, and next up could be another No. 1 seed in the NCAA tournament. LAS VEGAS — Gonzaga coach Mark Few brought in veteran transfers and one of the best recruiting classes in school history this season, a group that’s been called the best in his 18-year tenure as head coach. The Zags have lived up to the hype, nearly pulling off an undefeated regular season and earning another West Coast Conference tournament title. Next up could be another No. 1 seed in the NCAA tournament. Nigel Williams-Goss scored 22 points, Przemek Karnowski added 15 and No. 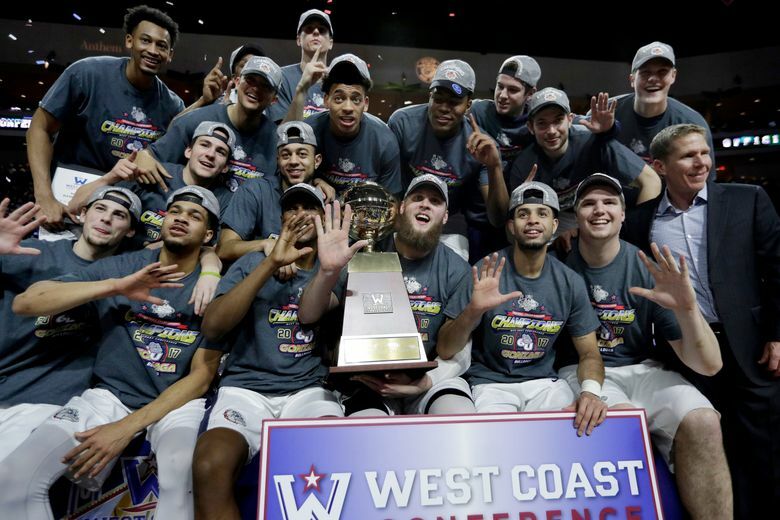 4 Gonzaga won its fifth straight WCC tournament title by beating No. 19 Saint Mary’s 74-56 Tuesday night. “It’s no secret: if we play our best basketball, dial into the process the coaches give us, play like we did in the first half at both ends of the floor, there’s no doubt in our minds we can go win the whole entire tournament,” said Williams-Goss, who also had six assists, six rebounds and six steals. Gonzaga (32-1), the regular-season WCC champion, was not particularly sharp in the WCC semifinals, beating Santa Clara by nine to reach the title game for the 20th straight season. The Zags got their mojo back in a dazzling first half against Saint Mary’s, then had to hold on after a shaky start to the second. Gonzaga shot 50 percent overall, scored 20 points off turnovers and had a 38-22 advantage inside, staking claim to a potential No. 1 seed in the NCAA tournament. Saint Mary’s (28-4) fought back after an ugly first half with a big charge in the second. The Gaels could not make it all the way back from a 21-point deficit, though, losing to the Zags for the third time this season. Calvin Hermanson had 14 points and Jock Landale 10 for the Gaels, who must wait out selection Sunday for the second straight season. Gonzaga and Saint Mary’s in the WCC final has become an annual tradition. The conference’s top two teams have met in the title game seven of the past nine years, with the Zags winning six of them. Saint Mary’s was discombobulated in the first half, hitting 6 of 28 shots and turning it over 10 times while scoring 18 first-half points. Gonzaga turned the missed shots and turnovers into a 39-18 halftime lead. The Gaels were better to start the second, shutting the Zags down while trimming the lead to 51-46. They got no closer. Landale had to leave after picking up his fourth foul and Gonzaga took advantage, stretching the lead back to double digits. • Few was named the USA Today National Coach of the Year and the USBWA District IX Coach of the Year, while Williams-Goss and Karnowski were selected to the USBWA District IX Team.